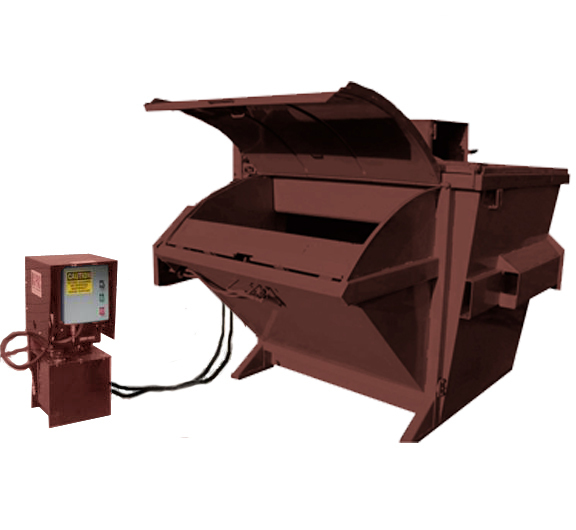 X's indicate compactors most commonly used in each type of application. Great for utility rooms & storage areas Compacts about 750 gal of loose trash or roughly 4 Cubic Yards into a small cube that can be disposed of easily. Great for utility rooms & storage areas. 3 Different Sizes that hold from 300 to 1000 gallons of trash (approx.) before needing to be emptied. Just position over a drum, box (UN / DOT) or trash container (95 gal) and the contents are ready to be compacted. Use building chute systems that flow to the compactor. Can help greatly with reducing the waste processing costs in Hi-Rise Buildings. Also referred to as Public Area compactors, they are just like traditional trash bins except they compact automatically based on traffic flow. They hold about 300 gallons of trash and are excellent for reducing trash related labor costs as well as overflowing bins. 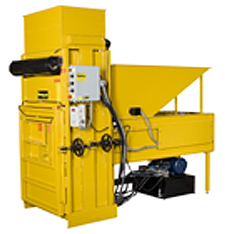 Whether it is a Bottle Can Crusher or a Bulb Crusher for fluorescent bulbs (or other requirement such as Marine Use) there is probably a specialty compactor that will fill the need. 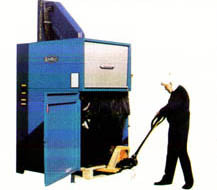 Specialty Compactors are available for both Indoors and Outdoors. Holds approx 25 - 30 cubic yards of trash. 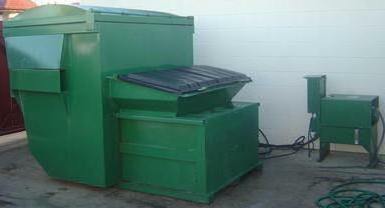 Dumpsters are tipped onsite just like any other dumpster. Detachable Containers can be wheeled to the tipping area and easily tipped by hauler. 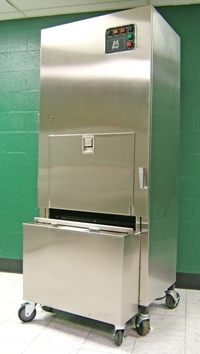 Compactors can be loaded from the front or fed by a thru-wall chute opening. 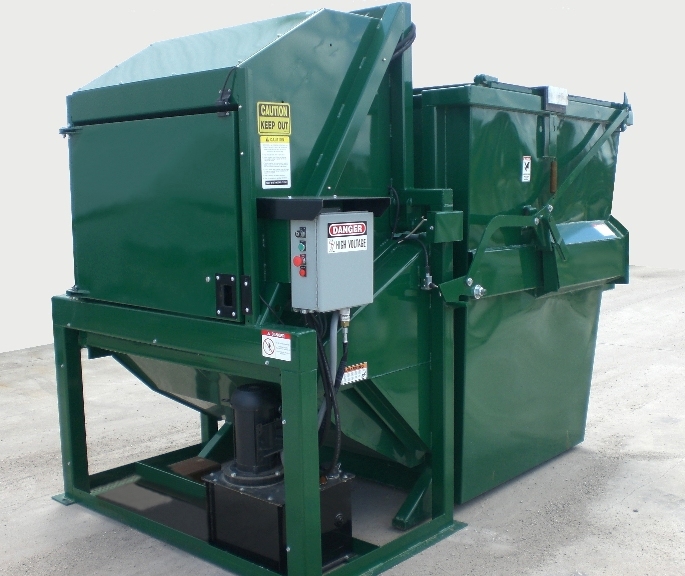 These compactors work in conjunction with a large container (30 yd, 40 yd etc) and can be manually fed or chute fed. 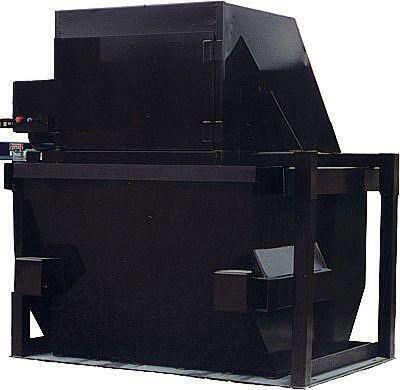 Similar to a Stationary Compactor except the container and compaction are combined into a single (non-separable) unit which helps with applications that want to prevent leakage of liquids from the waste. Similar to the typical Self Contained compactors only much smaller and they are tipped onsite. Trash can either end up in a huge polybag sitting on pallet or in a container on wheels ready to be tipped by hauler.